"Excuse me, could I get one of those placards to bring home?" I turned to find four members of the same family, clutching the California State flag as they walked away from the Anti-Bush demonstration, looking for Sinn Féin placards. As two American women, yet again looking for placards as souvenirs put it, "He's our President, you think you guys have problems?" The 20,000 people who took part in the massive demonstration against the visit of George W Bush last Friday night were very clear about why they were there. As speakers repeatedly made clear, they were motivated by their opposition to the war on Iraq, to Bush's support for Israel's illegal occupation of Palestine and to US foreign policy. 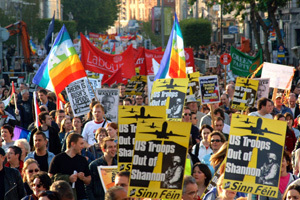 They were also marching in support of Irish neutrality and expressing opposition to the Dublin Government's decision to allow the use of Shannon Airport by US forces en route to the Middle East. Organised by the Peace and Neutrality Alliance, the NGO Peace Alliance and the Irish Anti-War Movement, the march was bedevilled by efforts to censor pre-publicity, with posters being ripped down by the council as quickly as they were put up and the Broadcasting Commission banning radio advertisements for fundraising gigs. Despite this, a broad cross-section of Ireland took to the streets in Dublin, and in smaller demonstrations in Shannon and Galway and elsewhere across the country, to register their opposition to Bush's visit to Ireland and his aggressive foreign policy. Student anarchists and former republican POWs marched next to Labour councillors and people on their first political protest. A number of American citizens were also present on the march, with national or state flags and some of their own creation. Speakers repeatedly stressed that the demonstration was not anti-American in nature and expressed solidarity with those millions of Americans taking to the streets to oppose the war. Jack O'Connor, President of SIPTU, read out a message of solidarity from Roger Toussaint, President of Local 100, Transport Workers' Union of America in New York. "The Iraq war is Bush's war, not the American people's war! The war on Iraq is unjustified, immoral, and illegal. The war is based on lies," declared Toussaint. "Millions of American working people hope that the Irish people turn out in monster rallies to show Bush all the contempt he fully deserves. We thank you and salute you." Sinn Féin spokesperson on International Affairs, Aengus Ó Snodaigh TD, referred to the massive security measures put in place around Dromoland Castle. "The last time Martial Law was declared in County Clare was in the 1920s and it was brutally enforced by the Black and Tans," he pointed out. "We need a massive show of strength in Dromoland Castle to make it clear to this Government that we will not be intimidated by the Black and Tans of today."